I’m a big fan of small-cap investment trusts but one of my holdings, Acorn Income Fund, definitely won’t suit everyone. It’s much more highly geared than your typical fund, adding an extra layer of risk. But this also makes it a good candidate for opportunistic top-ups. Acorn Income Fund is one of three UK small-cap investment trusts I own right now, the other two being Henderson Smaller Companies and BlackRock Smaller Companies. All three have good track records although Henderson and BlackRock have been around a lot longer. Acorn Income Fund is by far the smallest of the three. The other main difference is that its gearing level is about twelve times higher than either Henderson or BlackRock (48% versus 4%). This higher level of borrowing, plus the fact that also invests in fixed-income securities, means Acorn’s dividend yield is much higher than most other small-cap funds. Acorn’s gearing magnifies the price gains from its underlying portfolio. And it does the same for losses, as happened in 2018. This is definitely a trust where you need to be prepared for both the rough and the smooth! * both these figures assume the March 2019 dividend of 5.2p is repeated for the remaining three quarters of 2019. Acorn Income Fund is still a young pup by investment trust standards, having joined the market in 1999. For the first several years, it was run by Collins Stewart. However, a large proportion of shareholders (68%) voted for the trust to be wound up at its 2006 AGM. That was below the 75% required for a wind-up to proceed, so an arrangement was struck with Premier Asset Management to take over the management of Acorn instead. At the same time, a tender offer was made that enabled nearly 70% of shareholders to get their money back. Premier then became the investment adviser for Acorn’s Income Portfolio of fixed-interest securities, which has been run by Paul Smith for many years. Premier is listed on the London Stock Exchange (its market cap is around £210m) and it primarily runs open-ended funds but it also operates two investment trusts, the other being Premier Global Infrastructure Trust. In total, its assets under management are just over £6bn. The Smaller Companies Portfolio is run by a different firm called Unicorn Asset Management, who has been involved since the Collins Stewart days (the earliest reference to Unicorn I could find was dated 2001). Unicorn is a small-company specialist, perhaps best known for its Unicorn AIM VCT, and it manages around £1bn in total. John McClure, a much-admired small-cap specialist, managed the Smaller Companies Portfolio for many years. Sadly, he died at just 50 years of age in 2014 after a short illness. McClure’s successors were Simon Moon and Fraser Mackersie, who had already been working alongside him running the portfolio since 2008. Both Moon and Mackersie also manage some of Unicorn’s other funds. Acorn aims to invest in no more than 50 small-cap companies and generally favours those with higher yields and more of a domestic focus. The Smaller Companies Portfolio typically makes up 70-80% of Acorn’s assets, with the Income Portfolio accounting for the other 20-30%. As small-cap share prices tend to be much more volatile than fixed-income securities, the weighting of the two portfolios can shift around a fair amount. Acorn’s management can either go with the flow or make a conscious decision to adjust the weighting. Up until fairly recently, Acorn’s management was happy with an even higher weighting towards smaller companies. For example, at the start of 2018, it was 83%. However, last August, Acorn decided to take a more conservative view, due to concerns about how Brexit uncertainty might affect its largely domestic-focussed portfolio. By the end of 2018, as small-cap share prices fell significantly, the ratio had become 74% in Smaller Companies and 26% in Income. With the rebound in share prices since the start of 2019, I would expect the ratio is probably back to around 80%/20% again. Since 2011, Acorn Income Fund has used zero-dividend preference shares (ZDPs) as its main borrowing method. Prior to that, it used bank debt. So, how do ZDPs work? Well, preference shares sit between equity (i.e. ordinary shares) and debt. When a company is wound up, they rank after bank debt, the taxman, and most other creditors in the order of payments. But they are repaid before ordinary shares. They typically have a fixed annual dividend rate, rather than being entitled to share of profits like ordinary shares. Given that they rank behind debts in the pecking order, you’d typically expect them to offer a slightly higher rate of interest. Zero-dividend preference shares are a specialised type of preference share. As the name suggests, they don’t pay out an annual dividend. Typically, they only exist for a few years and then you get a final payment. That final payment is higher than the initial price you paid, effectively giving you a rolled-up ‘interest’ payment at the end. Here are the numbers for Acorn’s ZDPs. The current batch started in January 2017 at the placing price of 138p. They are due to be repaid at 167.2p on 28 February 2022. The final amount is 21.1% higher than the initial price paid, which works out as an effective annual rate of 3.85%. This is the second set of Acorn ZDPs. The first 12m were issued at the end of 2011 at 100p per share. They carried an effective annual rate of 6.5%, with the 138p final payment on 31 January 2017. When Acorn issued its first set of ZDPs in 2011, it increased its level of gearing significantly. Its bank debt was £6m at the time but it raised a net £11.6m by issuing 12m ZDP shares. Roughly half the amount raised paid off the bank debt and the other half was invested. The 2010s have generally been kind to small-caps. 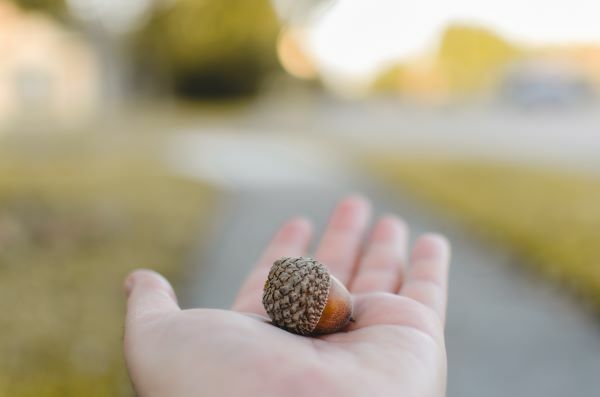 As Acorn’s assets have increased significantly, additional ZDPs have been issued to maintain its level of gearing at more or less the same level. By the time the first continuation vote was held in late 2016, they were about 21.3m ZDPs in issue. 91.4% of holders elected to roll over their money into the second set of the ZDPs. Therefore, Acorn Income only had to repay about £2.5m. A second continuation vote is due to be held in late 2021. With 21.2m ZDPs in issue, Acorn could theoretically be on the hook to repay as much as £35.5m. Only £31.5m is recorded as a debt on the company’s balance sheet right now, as the rolled-up dividend payment is spread over each year the ZDPs are in existence. Hopefully, a similarly large majority of ZDP holders will elect to roll over again come 2021. However, if markets are in a slump at that time, who knows what might happen? Acorn Income Fund’s gross assets are currently £97m with, I would estimate, around £25m in fixed-income securities and cash. If the ZDPs had to be redeemed in full, a sizeable chunk of the small-cap portfolio would need to be sold. I did say this trust wouldn’t suit everyone! It was problems of this nature that caused the split-capital scandal of the early 2000s. Back then, ZDPs were marketed as low-risk investments to cautious investors. But many investment trusts overdid it, issuing way too many ZDPs. When the bear market of 2000-03 took hold, the value of their assets plummeted. Not only where the ordinary shareholders wiped out, there wasn’t enough to repay some ZDPs in full either. It’s reckoned that around 50,000 investors lost £700m. A compensation fund was set up a few years later, but only for £144m. ZDPs tend to be fairly rare these days, with fewer than 10 out of the 400 or so investment trusts using them as a form of borrowing. Like many things, moderation is the key. Too much debt, in any form, is dangerous and sometimes fatal. However, one drawback with Acorn’s use of ZDPs is that they are all repayable at the same time. With £35.5m potentially on the line, I think it would make more sense to use a mixture of redemption dates, similar to the way companies often stagger their loan redemption dates. Here’s a chart showing dividends since Acorn Income Fund was first listed. Dividends of 20.8p seem likely for this year if the 5.2p dividend paid in March 2019 is repeated for the remaining three quarterly payments. That’s been the pattern for several years now, but there’s no guarantee it will always hold true. Despite a strong start, you can see that dividends were essentially flat from 1999 to 2008. The fall in 2003 matches the end of a bear market, but I haven’t really looked into why they stayed at much the same level for the following five years when markets generally did pretty well. The dividend then fell by a quarter in 2009, as the financial crisis took hold, and then jumped markedly in 2012 when the ZDPs were issued. If 20.8p is paid out for 2019 then that will represent growth of 63% since 2014. The revenue reserve is around 20p per share, so about a year’s dividend has been held back to help smooth future payments. This chart shows Acorn’s performance against the Numis Smaller Companies Index (NSCI) and the ramp-up in outperformance that began when the extra gearing was employed from 2012 onwards. The NSCI measures the smallest 10% of the UK stock market. In 2018, net asset value fell 17% while the NSCI slipped 15%. On a share price return basis, the fall was 24% as the discount to net assets widened quite a lot, mostly in December. The FTSE All-Share was down 9.5% in 2018, so it was a bad year for small caps relative to the wider UK market. There is another handy chart showing how Acorn has compared on a return and volatility basis. 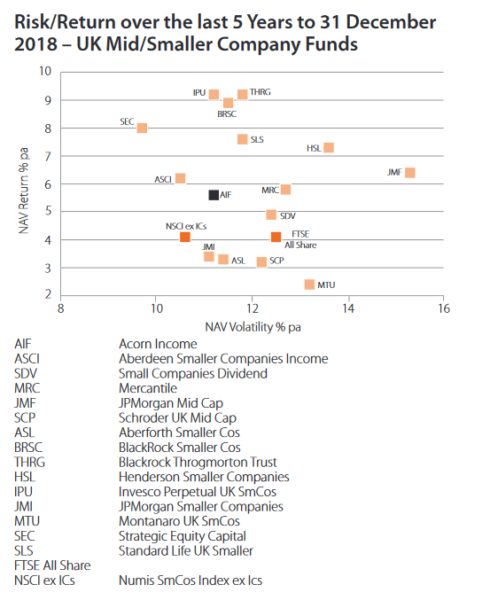 Somewhat surprisingly, Acorn has been less volatile than many of its smaller-company peers. Note that the volatility shown here is on a net asset value basis. When it comes to the share price, I’d say Acorn Income is more volatile than most, as its discount to net assets seems to jump around quite a lot. Another observation from this chart is that because the five years to December 2018 was a low-ish period for UK small cap returns, Acorn Income’s performance has been pretty middling. That’s mostly down to its higher level of gearing I think. Curiously, one of the very best performers, Rights & Issues, isn’t included this chart for some reason. Over the last ten years, Acorn Income rises to near the top of the pile, demonstrating why this is a trust you have to hold for a long time if you want the higher level of gearing to work in your favour. 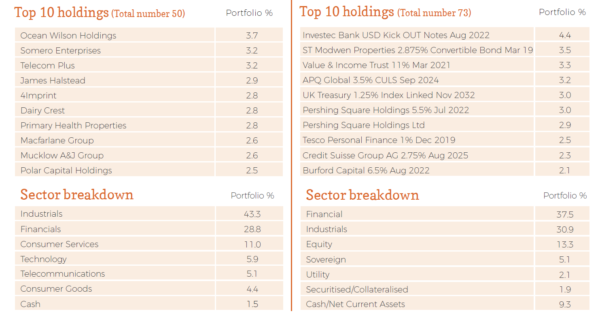 Here are Acorn Income Fund’s top holdings as of the end of February 2019. Despite the fact there are only 50 shares in the Smaller Companies Portfolio, it is fairly evenly distributed with the largest holding being less than 4%. Sector-wise, financials and industrials (both a fairly broad church) dominate both the portfolios. In terms of size, over 60% of the portfolio is invested in companies valued at £75m to £500m. Roughly 20% is in £500m-£1bn and 10% in £1bn plus. One recent notable faux-pas was Acorn’s investment in Conviviality Retail. It went bust in a spectacular fashion this time last year after ‘discovering’ an unexpected £30m tax bill. Unfortunately, it was one of Acorn’s biggest positions. Its demise wiped around 3% off its net asset value in one fell swoop. That said, thanks to previous dividends from Conviviality and earlier partial sales, Acorn made an overall profit. Warpaint London and Clipper Logistics were other big negative performers in 2018. Notably, despite these three setbacks, the Smaller Companies Portfolio recorded a 14% drop in 2018, so it actually performed slightly better than the NSCI. A lot of companies in the portfolio were also derated significantly. Acorn said the average price-earnings multiple for its holdings fell by 18% over the course of 2018. Acorn’s basic management fee is 0.7%, which doesn’t seem too unreasonable given the relatively small size of the fund. It’s charged on total assets, though, so the management fee as a percentage of net assets (i.e. taking off the borrowing) is probably just over 1%. There is also a 15% performance fee dependent on two separate hurdles. The first is a 10% compounded gain in net asset value since the tender offer in 2007. The second is a so-called high water mark of the highest previous closing net asset value in a year that a performance fee was paid. The ongoing charges figure was 1.57% for 2018. Total expenses came to £1.2m in 2018 but were £1.9m in 2017 as a £0.6m performance fee was payable. The fact that the breakdown doesn’t add up to 4.1% suggests the total figure might be calculated on the share price while the breakdown is on net assets. This KID was published in May 2018 and uses data from February 2018, so I would expect to see an updated version soon. I suspect this fund will always be one of my smallest positions given its high level of gearing. However, my plan here is to take advantage of the fact it should have periods where it’s a lot more volatile than other small-cap funds. My initial position was tiny by my usual standards, with the idea of topping up over the long term, especially when the discount to net assets widens significantly. As it happens, just such an opportunity seemed to present itself at the start of this year. The discount widened from a few per cent to around fifteen in just a few weeks. I’m all strapped in, ready to see where this one goes. This was a really good one when run by John McClure, what a sad story that he passed so young. If I recall correctly, his fund was a star performer within ‘The White List’ which has highlighted the top performing income funds for a few years now. I think that fund might have been the open-ended equivalent as I don’t think the White List includes investment trusts. But I think it had many holdings in common and McClure certainly seems to have been widely respected. I see Edison has published an updated research note for Acorn today. Next Post: Should You Avoid Investment Trusts With Premiums?